For a long time I only associated George Orwell with Animal Farm and 1984 and it never occurred to me to look into what else he may have written…until last year when I read Coming Up for Air and was surprised by how much I enjoyed it. I wanted to read more of his books, so a few weeks ago I picked up his 1936 novel Keep the Aspidistra Flying. 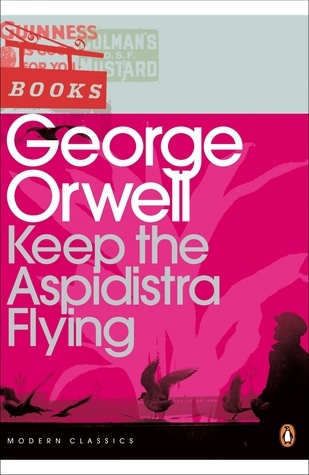 Keep the Aspidistra Flying is the story of Gordon Comstock, a struggling poet who gives up a secure job at an advertising agency to escape from what he calls “worship of the Money God”. Determined not to live a life ruled by money and capitalism, Gordon takes a poorly-paid job in a bookshop in the hope that this will free his soul and allow him to concentrate on his poetry. In reality, all that happens is that he finds himself living in a squalid lodging house with no money for food or cigarettes, unable to afford to go out with his friends or his girlfriend, and failing to make any progress with his masterpiece, London Pleasures. Even as he begins to feel disillusioned and depressed, Gordon still insists that he is doing the right thing and refuses to even consider going back to his old, well-paid job. In the corner of his room he keeps an aspidistra, a house plant popular in the 1930s, which he views as a symbol of the middle-class respectability and conformity he is trying to avoid. Eventually, though, he receives some unexpected news that will force him to make an important decision about his future and to decide what is most important to him. Gordon is the sort of character some readers will be able to identify with while others will find him completely infuriating! I did have some sympathy for him at first; I admired his principles and could understand his desire to escape from convention and the worship of money. But as the story progressed, I found him more and more frustrating (my sympathies quickly shifted to his long-suffering girlfriend, Rosemary). Far from freeing himself of money-dependency, he was more obsessed with it than anyone else in the novel, blaming every negative thing that happened in his life on his lack of money. The world is full of people doing jobs they would rather not be doing just so that they can make ends meet; I couldn’t feel sorry for someone who was choosing to impose poverty on himself while taking money from his hardworking sister, knowing that he would never pay it back. I don’t know much about George Orwell as a person, but I guessed that parts of Gordon Comstock’s story were probably autobiographical and I confirmed this when I turned back to read the introduction after finishing the book. I also discovered that Orwell himself didn’t rate this novel very highly and I do certainly think it was the weakest of the four books of his that I’ve read so far – although I did still enjoy it. As well as telling Gordon’s personal story, Orwell also paints a vivid picture of life in 1930s London and I really liked this aspect of the book – and I loved the opening chapter in which Gordon describes the customers who come into the bookshop where he works. I still have two of Orwell’s novels left to read as well as his non-fiction; I’m looking forward to reading more of his work, especially Down and Out in Paris and London and The Road to Wigan Pier. I’ve only read 1984 (well, the parts it I had to read for uni) and Down and Out in Paris in London, and like you I’m curious about the rest of Orwell’s work. This one sounds interesting and I think I’d like the descriptions of London at the time. Down and Out is very good too, if rather bleak. Yes, this is an interesting book and I did enjoy it, despite being irritated by the main character! I’m pleased to hear you liked Down and Out. I’ll be prepared for it being bleak! I read this year’s ago. I must get back to Orwell such a great writer. I love Orwell’s writing. I’m just sorry it has taken me so long to look past his more famous books and start reading his others. I’m slowly working my way through his books and most recently read Homage to Catalonia which is well worth reading. Homage to Catalonia hasn’t sounded as appealing to me as some of his others, so it’s good to know that you found it worth reading. I would like to read all of his books eventually.